The long nightmare of Jim Bowden may finally be over for Nats fans. Baseball Prospectus is reporting that the Nats are close to firing Bowden, and replacing him with Tony LaCava from Toronto Blue Jays’ front office. Bowden’s currently under FBI investigation for involvement in a bonus-skimming scandal that has been going on since the mid 1990s. Bowden’s right hand for scouting in Latin America, Jose Rijo, is about to be fired for his part in the Esmailyn Gonzalez scandal. 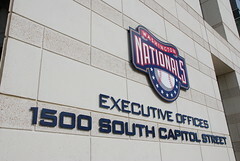 Most interesting in all of this, is that Bud Selig has reportedly issued the Nats an exemption from the “Rooney rule” which would require them to interview at least one minority candidate in the process. While I’m generally for diversity, this seems to be a special exemption due to the fact that our GM could be about to be fired for cause. This close to the start of the season, it would be rather unfortunate to have to spend a lot of time interviewing candidates. Did the Nats join the NFL? Unless I am missing something why would they be subject to the Rooney rule? There’s a baseball equivalent of the Rooney Rule.